More importantly though, HoudahSpot shows the most relevant properties based on the type of the selected file. E.g. 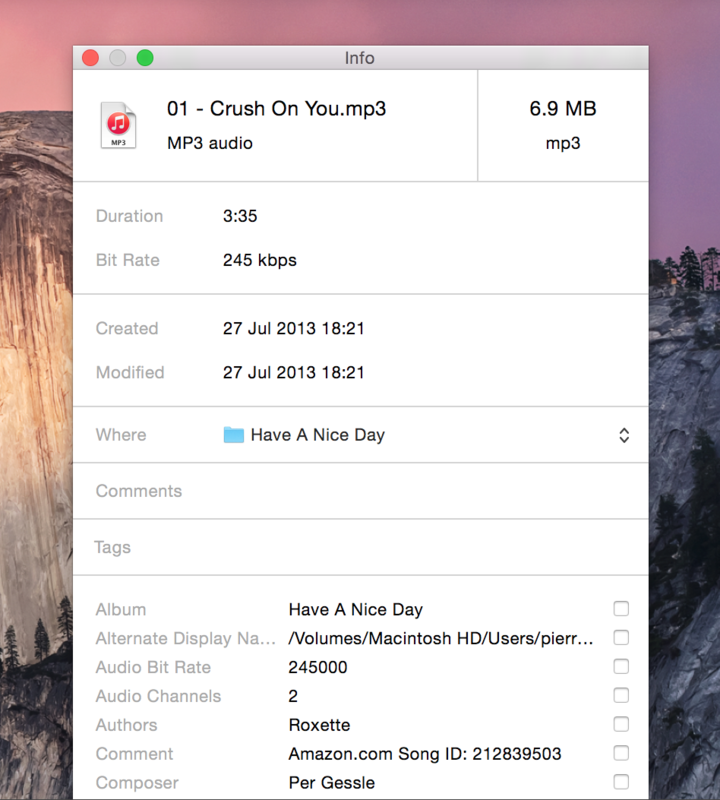 for audio files, the Info pane shows duration and bit rate. Below this summary, the Info pane lists all metadata registered with Spotlight. These are the attributes you can use when searching for other files of the same type. You can refine a search by dragging values from the list to the search criteria in the Refine pane. You can also use the checkboxes in the Info pane to filter current search results to show only files sharing the same properties. HoudahSpot can show information for any file indexed by Spotlight. Not just files from the current search results. This technique comes in handy when you need to know the total size of a folder. Drag the folder into the File Info window and give HoudahSpot a moment to compute the combined size of all files in the folder.